Today we have a great question from one of our readers…how do I stick with my New Year’s fitness goals? It’s about that time of year when those New Year’s Resolutions begin to wane and many people are slipping off the track to their goals for the year. Don’t let that happen to you! If you started a new fitness routine at the beginning of 2016, it’s likely that you’re just starting to see real results. Of course this is also the time when you’re starting to feel like giving up because those results may not be as grand as you thought they’d be by this point. Don’t give up yet, the magic is just about to start happening! It takes about 8-10 weeks for the body to begin seriously adapting to a consistent exercise routine. Stick with it at least one more month and I bet you’ll see some huge results in the next few weeks. That may even be enough motivation itself to keep you going! Aside from trying to stick with it for a few more weeks, here are 5 tips to keep you going when you face obstacles. Workout with a Trainer. It’s always a good idea to be accountable to someone when you’re trying to reach a goal. 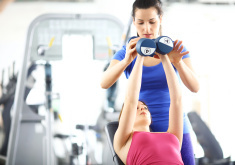 Personal trainers provide ample motivation and accountability for your health goals. Each time you meet with your trainer, he/she is going to ask you about your week and if you stuck with your workouts (and eating routine). There’s nothing like having to admit your shortcomings to someone else that helps to keep you on track! On top of that, your trainer will help to develop workout plans for you that are specifically geared toward your body and goals, which may actually help you reach your goals faster. I know what you’re thinking…hiring a personal trainer is expensive! Yes, personal trainers can be expensive, but so is cable TV and a lot of the other luxuries we surround ourselves with each day. It really comes down to how you want to prioritize your money and where your values are. Is there something extra that you purchase each month that may be hindering (or at least not contributing) to your healthy lifestyle? Consider giving that up to fund working out with a trainer. Give yourself a break. Reaching your goals is a mindset really more than anything else. Don’t let setbacks deter you from continuing to strive for your goal. Everyday isn’t going to always go as planned. I bet you’ve already learned that lesson in other areas of your life. Maybe you woke up this morning with every intention of getting that workout in after work, but something happened and it just became impossible for you to workout. Don’t get discouraged! The worst thing you can do is start to tell yourself that “it’s too hard to fit working out into my schedule” or “I’m never going to reach my fitness goals.” Instead, give yourself some leeway and instead say to yourself “getting my workout in today wasn’t an option, but that doesn’t mean it will be like that tomorrow.” Acknowledge that some days don’t go as planned, but that doesn’t mean everyday won’t go as planned. Also, I bet there might be somewhere else in your schedule you can squeeze that missed workout in if you really wanted to. That may mean getting up an hour earlier the next day or rescheduling evening plans—and, if that isn’t an option, don’t sweat it. Get up and get back on track with your next scheduled workout. Tomorrow is always another day to take a step in the direction of your goals. Make smaller goals for yourself. A goal like losing 50 pounds can be a really daunting task and it’s going to be awhile before you reach it. Instead create smaller, more manageable goals that have you seeing results more quickly, such as losing 2 pounds by the end of the week or forgoing that dessert on your night out. When you come to and reach these smaller goals, you’ll be feeling great about yourself, which will definitely help to keep you motivated as you set your next small goal! I really like to set weekly goals and then reward myself at the end of the week if I reach them. It’s those small rewards that help to keep me motivated as the week gets stressful and overwhelming. Important: never make food a reward! Food is meant to nourish and promote your health, it should never be something you give yourself for reaching a goal. A lot of this has to do with how your brain works. If you’re giving yourself unhealthy foods as a reward, it makes your brain want them even more because you’re perceiving them as valuable. Don’t let dessert be at the top of your value system, instead choose your health and well-being. A better goal would be something that involves self-care like a massage or something less expensive that you really enjoy. Focus on having fun. Becoming physically active shouldn’t just be about losing weight. It may start out that way, but try to find some physical activities that you actually enjoy. Just like anything in life, if you enjoy doing it then it won’t feel like work and you won’t dread it! Hate hitting the gym and weightlifting or running on a treadmill? Then, don’t do it! That’s the quickest way to burn yourself out from anything. Try out different activities, one of them is bound to be enjoyable. The thing about activities that you actually enjoy is that you’ll begin to look forward to doing them! Being physically active will turn into that part of your day that is just for you and a way to relieve stress, instead of just another thing you have to do. If you can’t find any activities that you really like, then try to enlist some friends or family members to join you for your workouts—it’s always more fun to do things with great people! Bonus, working out with others will help to keep you motivated. Win, win. Post a list of your goals where you can see it and start to visualize your life after you’ve achieved them. Close your eyes for a minute, now think, how amazing will you feel when you’ve reached your goals? Pretty amazing, right? Now, take that feeling and don’t let go of it. Really feel how amazing it will be to reach your goals. Continue to let that feeling in. When you get discouraged, close your eyes and visualize yourself reaching your goals. Let that feeling overcome any shred of negativity that may be creeping into your mind. It’s no secret, that 90% of our discouragement comes from our thoughts. Be part of the 10% that succeed by changing your thought patterns. Will it be easy? No, but there aren’t many things in life worth getting that are easy. At first it may seem daunting or silly to close your eyes and visualize yourself reaching a goal, but if you stick with it consistently, it will become a positive habit that will change your life for the better. Seriously, there’s nothing more motivating then taking the time to imagine what your life will be like once you achieve your goals! Staying motivated isn’t always easy. Some days, you’re going to encounter setbacks and others you may feel like you’re on top of the world. But, like anything else in life, it helps to implement strategies to keep yourself on track. Trust in the process and you’re already 50% of the way to your goal.